Extra Hot and salted tamarindo pulp candies. Product of De la Rosa. Pulparindo Salado y Extrapicante es un producto de la empresa De La Rosa. Dulces de tamarindo salado y enchilado. Este producto contiene 20 piezas individuales en empaque rojo (caja roja). i need to try it againg its so good and spicy that makes me eat more of those with that spicy taste. This is one of the best candy I've ever tasted. The candy arrived fast and fresh. I will definitely order more in the future. I just wished Mex Grocer carry "Burrito Tamarindo" as well. My girls and I absolutely LOVE this pulparindo. Cons way to GOOD I can eat a whole box in a day!!! I grew up eating these then...I moved and couldn't find then anymore glad I found it now. 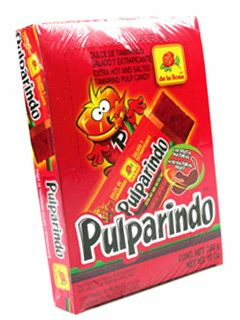 Pretty much the same pulparindo candy but with extra heat for those that crave it. I would eat some these during high school and share with friends. It was funny watching the few that didn't know what heat was running to the water fountain. ConsOne or two is fine but never eat a bunch, you might regret it later. Absolutely love thi ectra spicy & salted Pulparindo candy, very addicting. The price is affordable, except shipping/dellivery cost was bit high. These are pretty hot but sweet at the same time. They are very good! its hot and sweet if that what u like try this candy you will love it. Probably my most favorite candy in the world. If you like it hot, tamarind and sweet then this is for you.